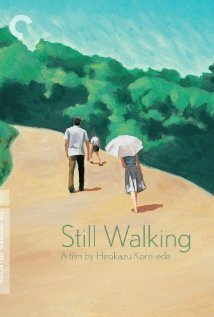 Still Walking is throbbing with Yasujiro Ozu style - from its opening to its very last shot that overlooks a harbor, as a train passes by. The last scene almost reminds the viewer of Ozu’s ending to his masterpiece Tokyo Story. The only real difference is that Kore-eda’s camera is more fluid, scenes are less formally framed and the camera is not always held at the below waist level. Like the Ozu film, though, this film follows a family gathering on the anniversary of the eldest son’s death. The eldest son was died by drowning, while saving the life of a local boy, twelve years ago. That son, Junpei, was to follow in his father’s footsteps as a doctor. The doctor is now retired, and lives with his wife, and the two of them have a classic love and hate relationship with each other. The old man resents his two surviving children, Chinami, a happy go lucky housewife with a used car salesman husband, a son and daughter, and Ryota, an unemployed art restorer, who recently married a young widow, Yukari, who has a son, Atsushi. In all, the setup is a classic family gathering. What makes this film so great is that it is not melodramatic - there is no shouting nor infidelities revealed. It’s real. Such a film eliminates the necessity of discussing the plot, as the film is full of moments that reveal the characters and their interrelations. We see how Ryota is resentful of his father, who belittles his art restoring work, and tries to escape the situation by constantly being on his cell phone. We see how the father and mother resent his new wife and stepson. The father openly wishes that Ryota had been the son that died, and his contempt is on full display upon first seeing his son in his home again. His mother is even worse than his father in how she subtly denigrates both the wife and stepson with subtle digs and not so subtle acts. Chinami is the peacemaker, but recognizes her father’s resentment toward her, for living while Junpei dies, and also her and her husband’s and children’s impending move in to the family home. Her mother also berates her at every turn, and makes snide comments on her children and husband- most notably that when Chinami’s husband offers to fix some bathroom tiles for the mother, the mother refuses and says he’s a guest, only later to chide him for offering, not following through, and acting as if he was a ‘guest.’ But most of the doctor’s and mother’s resentment is turned toward Yoshio, the boy (now young man) whom Junpei saved. Once a year they invite him over to their home to, as the mother says, make him feel as badly as they do, because she needs to do so. When he leaves they mock him for his poor lot in life, being overweight, and call him ‘useless trash’; all except Ryota. Then there is the relationship between Ryota and Atsushi, who calls his stepfather Ryo, despite his mother’s asking him to call him dad. We later find out that the boy actually misses his dead father immensely- so much so that he wants to be a piano tuner, like his father, and recalls catching yellow butterflies with his father, after he sees the grandmother chasing a yellow butterfly and believing it is Junpei returned to her, because it lands on her dead son’s photo. This is important because the boy, earlier in the film, several times pretended to barely remember his father, only to later, in a private moment, in the middle of the night, in the backyard, reveal that it was all an act. Yet, only the audience learns this. At film’s end there’s an even further payoff for the yellow butterfly trope as we see Ryota, a few years later, forgetting where he heard a myth about yellow butterflies, that he tells to a daughter he later has, just as his mother forgets where she heard the myth she tells to Ryota. And this sort of moment is also echoed when both Ryota and the grandmother, after trying and failing to recall the name of a sumo wrestler both finally do, after they have said goodbye (by shaking hands- a fact the grandmother relishes in when the doctor suggests it could have hurt Ryota’s wife’s and stepchild’s feelings), and are headed their own ways. And, as if these touches were not enough to satisfy, there’s an added little moment where the parents, as they walk back, think that this trip is the start of regular visits from Ryota and his family, whom they expect back for New Years, whereas he is relieved, riding on the bus home, and declares to his wife and stepson that this trip obviates any necessity for them to make an obligatory visit for New Year’s. All these sorts of moments weave a real, but deft, drama, and we see moments that in lesser films, mere melodramas, would explode into ‘tense confrontations,’ but here, become revelations like the doctor’s liking popular music only up to The Beatles, and thinking rap is crap. The acting is fantastic in that it is all natural- there is no scenery chewing, and Kore-eda’s well-paced and naturalistic script, and the unobtrusive, yet evocative cinematography, all work synergistically, but in the curious way of adding up to less than the sum of their parts….which is somehow perfect, because less equals more, at least in terms of naturalism. There’s not a forced moment in the film, and it is not a tearjerker. This is because it is a deeply and genuinely affecting film. Still Walking is an example of cinemature in both senses of the term: mature filmmaking and literature-like in its depth and profundity.